Book your Library Program for anytime until Nov. 30th and we’ll take $100 OFF your total cost. Call 1-800-411-3466 for details. Transform your Library into a Museum. We are the original company that ROCKS. 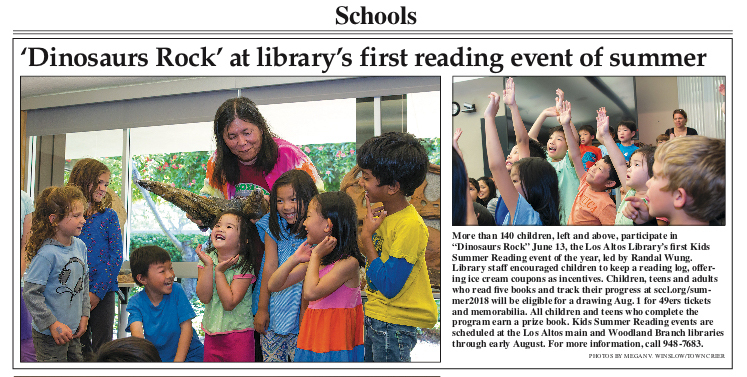 For over 18 years with over 6 Million guests, DINOSAURS ROCK® delivers amazing programs to Schools, Birthdays, Scouts, Hollywood, Exhibits and Libraries. Choose from 4 Highly Interactive Programs – DINOSAURS ROCK®, GEMS ROCK®, OCEANS ROCK®, and INSECTS ROCK®. Amazing displays, amazing presentation, and your guests always go home with really cool specimens. Your part in our summer discovery program was fabulous! The combo exhibit/dig format was absolutely perfect for our crew. Coming and going at leisure, mesmerized by the “dig”, and truly enjoying individual questions with the “Professor”. I am SO glad I discovered you at the NJ Science Teachers Conference last year! Our Programs transform your Library into a Museum. You will have a myriad of museum-quality (many genuine and life-size) dinosaur fossils and other prehistoric related items right in your own Library. Your guests will see specimens that are 10,000 to over 500 million years old. Highly interactive, educational & fun. Your guests will love searching for and finding to keep and take home real Rubies, Emeralds and crystals. The display is amazing with many beautiful specimens like Amethyst Geode, Citrine, many Gemstones and more. You’ll be treated to a very visual Video Presentioan that goes along with the presenter presentation. Dig for Beautiful Sea Shells, Sea Stars, Sea Glass & More! Pet a stingray without getting stung! Touch a shark without getting bitten! Dig and keep fossil shark teeth & more. HIghly interactive and extremely visual. Incredible dispaly of genuine sea-life (taxidermy) Genuine sharks, huge shark jaws, fish, sea shells, giant sponges and lots more. 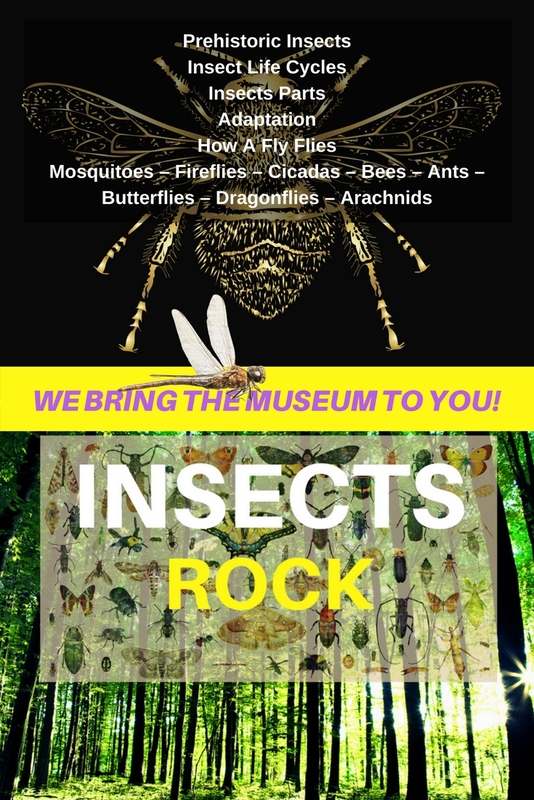 Your students will experience the following in a up-close, personal, hands-on approach…Prehistoric Insects, Insect Life Cycles, Insects Parts, Adaptation, How A Fly Flies. 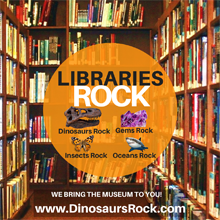 Libraries Rock with DINOSAURS ROCK® The original company that BRINGS THE MUSEUM TO YOU! The quality, breadth and scop of your display and information provided will make your geusts feel like this was the best programs they’ve ever attended. Call 1-800-411-3466 now to book your program. Incredible specimens to view and REAL AMBER to polish – Hey you might just find a prehistoric bug inside!